Bukhara invites you to enjoy great food in a plush and vibrant atmosphere. 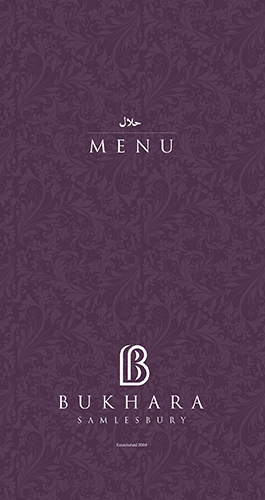 Specialising in traditional tandoori, curries, shish kebab, chicken tikka and biryani. Bukhara has created a fine dining experience. Our tasty dishes are prepared using fresh meat, vegetables, spices and herbs for that authentic taste. Our starters include delights such as the Till Mill Jhinga which is king prawns simply dusted with sesame seeds and cooked on a charcoal grill. Mains are equally flavoursome and include the Lahori Chicken, chicken tempered with fresh tomatoes, onions, ginger and green chillies. Akbari Chicken Masala - grilled pieces of chicken breast cooked in a rich creamy sauce. As time flows by, we create joyous and treasured memories which we hold dear in our hearts. We hold celebrations to mark these occasions and to build further special memories. In Preston, there is no better way to captivate that memory than at the lavish Bukhara restaurant. Whatever the occasion, you will be guaranteed a spectacular and luxurious dining experience at Bukhara. Our friendly team, authentic cuisine and attention to the finest detail will ensure you will be returning to build more beautiful memories. If it is a conference room that you need for various business meetings and events, you can count on Bukhara’s advanced facilities for a successful outcome. The room can cater for up to 60 guests confortably, and it includes a projector screen or a HD TV.